Trekking:October through May. October and November are probably the best months, when it is not too hot and there is still some snow left in the valley, and you can spend all day in the hot springs. Randonnée: June to the end of September. During the winter, you shouldn't have to carry your skies. From Chillan, it is 82km to Termas de Chillán. The first 72km are paved, and the last of a 8 dirt road in Good state. 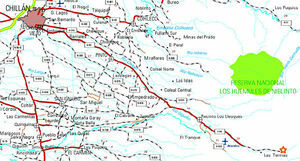 (The map mapa de turistel, shows it erroneously paved to the end). Rembus also goes to the Termas from the local bus station in Chillan, and as of April 2013 the cost is 3,000 CLP. The trek begins at the public hot springs, 1.3 km higher than the Grand Hotel Casino. If you go by car, you can park it by the access control by the pools (the public hot springs costs 6.500 CLP, totally recommended). A few steps to the left of the entrance to the Termas de Chillan resort hot springs, at the last curve before the parking lot, a path begins that ascends a forest of Coigües. At the start you will see a wooden that says "Cabalgatas a Fumarolas - T. Aguas Calientes - Cel. xxxxxxxx". This point is at 1.710 meters of elevation. you will see the second pass for the first time, towards the east, located next to the left of a tower of rocks. At this point, you will have two options: descend to the mud baths and then ascend through the valley, or ascend a few meters on the ridge towards some second geysers. If you take the geyser route, once these cross, you will see a fork, which isn't too visible. 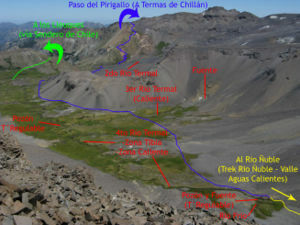 A path descends towards the valley and another follows the hillside without losing elevation, following a black tubing that carries water to Termas de Chillán. Although the path that descends to the valley will make you lose elevation and goes back through vegetation, it is a more comfortable trek than the traverse next to the tubing (the waypoint "Estero", though, corresponds to the traverse route). The main valley path is also very well marked with white round circles on rocks along the way. Along this main route, after about 30 minutes of walking through the forest the trees begin shrink until the vegetation disappears again at 2080 meters. 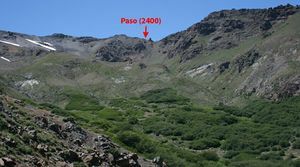 The track to the pass is very clear, along volcanic rock and scree, ascending to a maximum of 2400 meters (2 to 3 hours from the parking lot). You may find isolated spots of snow until the middle of the summer. From the pass, on a sunny day you can see the volcán Antuco and la Sierra Velluda to the south. The Valle de Aguas Calientes also can now be seen. As you descend there are two cross-paths which are blocked off by rocks, stay on the main trail. Continue to descend some 300 meters into the valley. 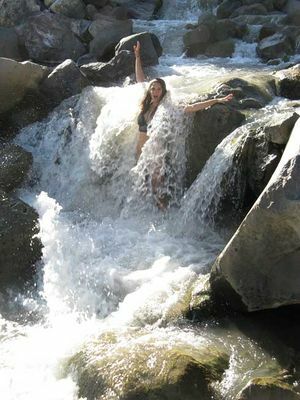 When you reach the bottom you will have to cross the first small thermal and cold water streams. Only 400 meters later (East) you will see the second thermal river. There are nice campsites here and the hike can be ended at this point. This campsite is more scenic than the second described, with views of the volcano, however the hot springs are quite hot. There is also a side hike upstream along the ridge once you cross the second thermal river which takes you to waterfalls (they can be dry off season). There is also a small waterfall slightly downstream at this site. 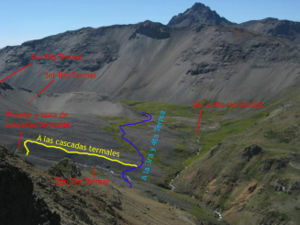 Continuing on the main trail from this site, 1.7KM later you will cross the third thermal stream. The water here at the source is quite hot and can be used to make coffee or tea. As of April 2013 there are no fees to access this trek. 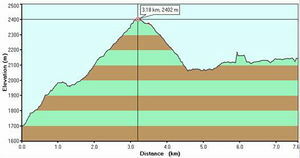 Waypoints formato Google Earth del trekking de Aguas Calientes. Waypoints formato Map Source del trekking de Aguas Calientes. 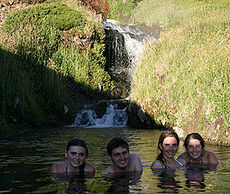 The closest lodging is in Las Trancas, 8KM from the Termas de Chillan. There are cabanas and hostales available. If you cross the bridge at the end of town, there is unofficial camping allowed to the right of the bridge.